Electrical power supply connector / circular / bayonet / power - EM52M - Hirose Electric Europe B.V.
Electricity - Electronics - Optics > Cable, Connector, Enclosure > Electrical power supply connector > Hirose Electric Europe B.V. Stand: Hirose Electric Europe B.V.
Group: Hirose Electric Co. Ltd.
EM52M Hirose Electric Europe B.V.
HIROSE Electric Co. Ltd, a world-class manufacturer in connectors, introduced its new robust lightweight circular EM52M Series. The series is ideal to connect wind power generation systems, medical equipment, and factory automation machinery applications. The push-on bayonet lock save designers valuable time and reduce the risk of electrical shock with the IP2X rated specification designed for finger protection against access to hazardous parts. 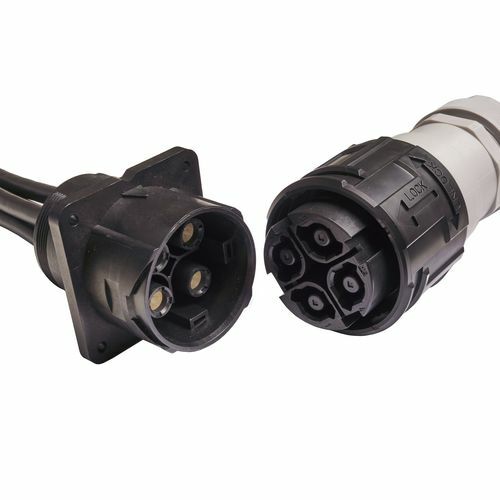 With the use of high-quality plastic material, the circular connector EM52M offers resistance to rough handling, for high current applications. In addition, the multi-point contact spring component helps reduce contact resistance and promotes a high current flow. The connector series offers two options of non-waterproof or waterproof versions, the latter achieved with the IP67 specification, which provides superior levels of dustproof and waterproof protection due to the built-in O-ring capable of withstanding liquid intrusion. A further benefit is that commercial tools are available to be used for this series. Termination of the crimp contact is quick and easy using standard JIS crimping tools. A contact removal tool is available to swiftly remove the contact from the housing. In this way, the connector benefits from a bayonet locking system - electromechanical security, vibration resistance and positive sealing - whilst providing the simple operation of a push-on design.